I encountered a wonderful survey article, "Robust statistics for outlier detection," by Peter Rousseeuw and Mia Hubert. Not only are the authors major contributors to the field of robust estimation, but the article is short and very readable. This blog post walks through the examples in the paper and shows how to compute each example by using SAS. In particular, this post shows how to compute robust estimates of location for univariate data. 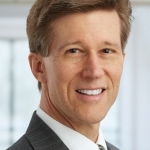 Future posts will show how to compute robust estimates of scale and multivariate estimates. In real data sets, it often happens that some observations are different from the majority. Such observations are called outliers. ...They do not fit the model well. It is very important to be able to detect these outliers. The quote explains why outlier detection is connected to robust estimation methods. Classical statistical estimators are so affected by the outliers that "the resulting fitted model does not allow [you]to detect the deviating observations." The goal of robust statistical methods is to "find a fit that is close to the fit [you]would have found without the [presence of]outliers." You can then identify the outliers by their large deviation from the robust model. As the song says, one of these points is not like the other.... The last datum is probably a miscoding of 6.31. The mean is not representative of the bulk of the data, but the median is. The UNIVARIATE procedure also supports these robust estimators. The trimmed and Winsorized means are computed by using the TRIM= and WINSOR= options, respectively. Not only does PROC UNIVARIATE compute robust estimates, but it computes standard errors as shown in the following example. Next time: Computing robust estimates of scale. Hi Rick, if you could do a blog post explaining "Data Depth" and how to calculate in SAS ( dont have IML) that would be great. The seminal paper for this is "MULTIVARIATE ANALYSIS BY DATA DEPTH: DESCRIPTIVE STATISTICS, GRAPHICS AND INFERENCE by BY REGINA Y. LIU, JESSE M. PARELIUS AND KESAR SINGH , The Annals of Statistics 1999, Vol. 27, No. 3, 783-858"
Thanks for the paper reference. I haven’t read it, but it sounds interesting. Readers: Does anyone know of code to do this in SAS? If so, post a link. Nice post. I think the trimmed and Winsorized mean are very under-utilized. Do you know of any literature indicating which of these is preferable, and under what conditions? 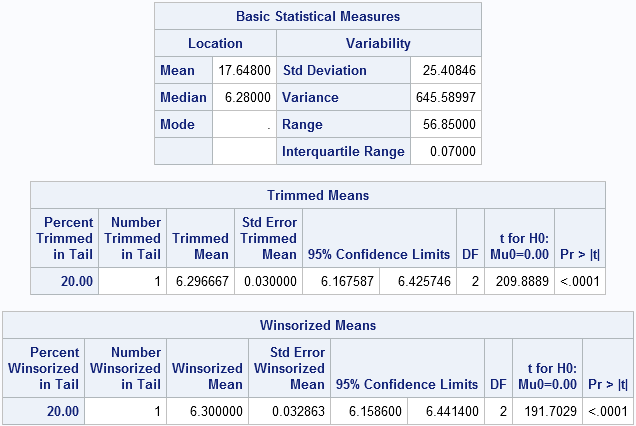 From a theoretical point of view, the trimmed/Winsorized means have some nice properties like formulas for standard errors/confidence intervals. However, they are not as robust as the median (which has a high "breakdown value") and, as I said, you have to "tune" them to the data, whereas the median works for all data, regardless of whether you have 5%, 10%, or 20% outliers. I would consider trimming/Winsorizing if I think that my data are from a contaminated normal distribution. That is, the "real" data are normally distributed, and the outliers are from a symmetric distribution with the same mean. If the data or outliers are skewed (for example, always larger than the population mean), I would not trim/Winsorize. I would do I know in advance the number of observations to trim or winsorized. I have huge data set about 13000 observation with outliers. If I am to winsorize, how many observations do I use? That's a good question. It depends on the distribution of the variable and how noisy the data are. Many researchers use 5% or 10% of the sample size. Once I've calculated the new trimmed values, how do I create a new dataset that drops the outliers?